Shepherds are getting their sheep and fleeces ready, vendors are getting wool, yarns and crafts ready for you to see and workshops are now in place. Come and join us at the fair. Located in the beautiful town of Cummington, Massachusetts, at the fairgrounds. Good food will be available bring the family for a day of fun. Sheep shows, Dog trails and lots of demos will await you. We are pleased to present our workshop schedule for 2017. We host great teachers from near and far. Bruce Engebretson writes for Spin Off Magazine, and teaches at Marshfield School of Weaving. He was trained in the Scandinavian tradition of fiber work. Katherine Johnson will teach us about Naalbinding, spelled variously: in English it is needle binding. Emily Gwynn enlightens us on using charts for knitting! 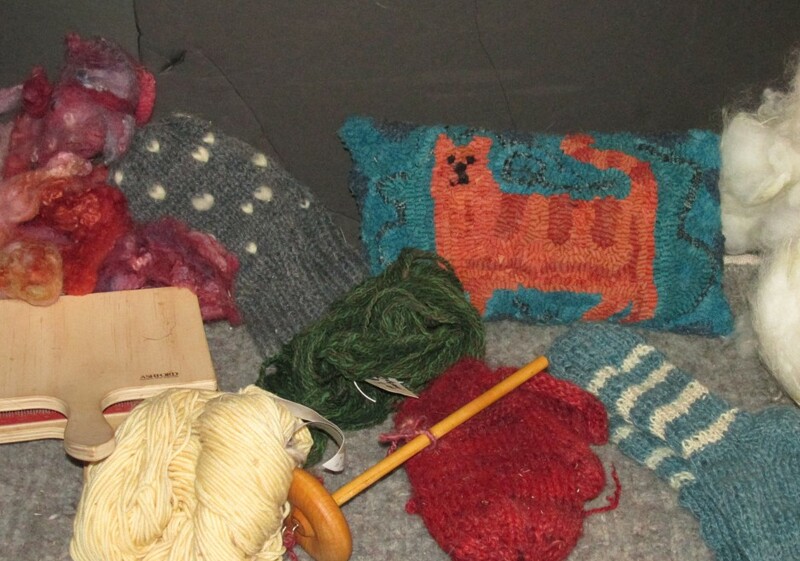 Dotty Taft will be bringing her fleet of drum carder for us to experiment on. A potluck supper will be held on the fairgrounds dining room at 6:00 p.m. on Saturday. Everyone is welcome. Please bring a prepared dish or salad sufficient to feed your family to the kitchen by 4:00 p.m. NO BREAD PLEASE! Rolls, beverages, and place settings will be provided. Both refrigerators and a warming are available on the grounds. My first Border Collie was Kate. Kate came from good working stock, but was not a keen dog (according to several very skilled handlers). Which was most fortunate! I got her when we’d only had sheep for a couple of years, I had a more than full time job, and was learning to weave. Also, I am not very coordinated, and my special direction sense is poor. Kate was a sweet beast, unusually laid back for a collie, and a great help penning up escaped chickens. She lived to a lovely old age. Kate taught me that working effectively with a herding dog was not easy. And, given my skill set, would be a huge challenge for me. My next dog came from a barter. I was working off farm just half time by now, and we were back from Woolman Hill and doing quite a few kids programs at the farm. Roy came from very intense (actually, his mother was really neurotic) stock. He was way too much for me and I also made lots of mistakes raising him….given his temperament I should have spent much more time socializing him. We worked with a trainer a lot (but a trainer who thoroughly intimidated me)- Roy showed excellent potential. But he was scared of kids (and we do lots of kids farm programs…) One day he wasn’t crated fast enough- and he bit a child. Fortunately not badly. Fortunately from a low key family we knew pretty well- from lots of programs. Roy went to live in Texas with a nice man who inspected oil wells and trialed on weekends. Never any problems- he liked traveling on inspections and loved working sheep. Fast forward to 2013. We moved to Colrain, to the hill farm I’d always wanted (can’t grow crops, but you sure can grow food, clothing and blankets!) Sweep is now seven- and what’s called a “useful dog”. Trained by a shepherd with limited dog skills, but he was great at fetching and moving sheep. My dear husband has always loved dogs, but never in all the years of moving sheep to different borrowed Leverett pastures thought the collies much better than a grain bucket. The hills here are steep and the fields quite wide. I noticed he took Sweep with him when moving fence…Sweep saved him lots of time and walking when the sheep decided to try for the hay field instead of the lower pasture. Maude is a different story. She is almost 7 . Is sometimes brilliant (did a fantastic job when the pigs got out last summer), and often difficult. Dog and shepherd need to be a team. After years of work, lessons, dog clinics and advice I’ve come to accept that we never will be a good one. She (and some others in her litter) have a head-strong streak- they periodically do not listen to (or perhaps simply cannot psychologically hear) the shepherd. I’m hoping to work intensively again with her this spring and summer- I think she can become an OK back-up for the aging Sweep. And here’s Maude. More ewe exercise. And the picture of us together tells you about our working relationship. And I’ve not mentioned Brynn. Brynn came to us from Washington state, at almost the same time as Bob. She was another OK herder, not a trial dog. She had a lovely pace, but was timid with our sheep. So she became our principal duck dog. (Ducks are useful to show people at farm events how border collies work- sheep are hard to lug around.) Three years ago her hearing got bad , two years ago her sight started going. She is a particularly sweet and happy thing (even happier than Kate). Now 11, she is pleased not to work, so stays here for walks and hugs.